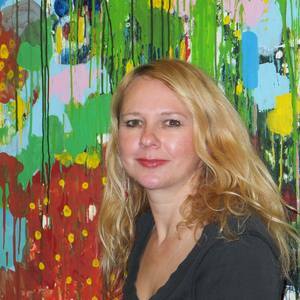 She was born in Lienz,Austria.Lives and works in Leipzig,Germany; Her education and professionalism aside,Christina Reiter`s art is in particular influenced by the eyes of a child,which she has kept since her growing up.Those eyes that have swallowed then-and are reflecting now-the woods and meadows,mountains and valleys of her home.And it is a deep,heartfelt happiness that you can see even in a brief encounter with the artist,a delight in the depth of colour and form,which is the original sound that shapes and carries her pieces. It is also the impressions of foreign lands and places that give width to the depth,and put her works into the context not only of colourful memories but moreover of changing mental backgrounds. Christina does not paint her paintings.She works them.Works them spreading and abrading colour(she called it "grattage") and,thus,allows the viewer to realize the deeper meaning of the process of creation as labor.This creates not only optical depths but lets the material communicate with the viewer about the work they have undergone.You can enter her work`s process.She does not hide the room of the artistic creation;she allows participating-in some way-in its birth,and in its inner completion,in the cutting of the creative umbilical cord,when the work of art begins its life with the viewer.